WASHINGTON, DC, December 14, 2016 (ENS) – President-elect Donald Trump has chosen Montana’s sole Congressman Republican Ryan Zinke as his Secretary of the Interior. If confirmed by the Senate, he would manage U.S. natural resources and public lands such as national parks, monuments and endangered species. In Congress since 2015, Zinke has voted to support environmental conservation just three percent of the time, according to the League of Conservation Voters. Zinke, 55, was born in Bozeman, Montana and attended the University of Oregon, where he was a lineman for the Oregon Ducks football team. He earned a B.S. in geology in 1984, an M.B.A. from National University in 1991 and an M.S. in global leadership from the University of San Diego in 2003. Zinke served as a U.S. Navy SEAL from 1986 to 2008, retiring at the rank of Commander. He was elected to the Montana Senate, where he served two years from January 2009. He was elected to the U.S. House of Representatives, where he took office on January 3, 2015. In Congress, Zinke has often voted against environmentalists on coal, oil and gas extraction issues. Yet, Zinke broke with most Republicans on the transfer of federal lands to the states, calling such proposals “extreme” and voting to defeat them. 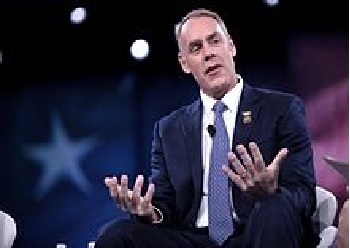 In July 2016, Zinke withdrew as a delegate to the Republican nominating convention in protest of a plank in the party’s draft platform that would require that “certain” public lands be transferred to state control. Zinke said he endorses “better management of federal land” rather than transfer to the states. Trump named Zinke as his choice to head Interior on Tuesday, crowning what was already a red-letter day for the Montana Congressman. Zinke Tuesday hailed the passage of the Blackfeet water compact by the House of Representatives in the Water Infrastructure Improvements Act for the Nation, WIIN, Act. The WIIN Act authorizes the Blackfeet water compact, ends decades of litigation and paves the way for more than US$420 million of investment in water, irrigation and infrastructure projects. The compact establishes the tribe’s water rights and confirms the tribe’s jurisdiction and authority to manage those rights. The U.S. House passed the WIIN Act on December 8; the Senate approved the legislation on September. Montana legislators approved the compact in 2009. But most environmentalists have little confidence that Zinke will protect the natural resources on U.S. public lands. “Zinke is only able to recognize the importance of programs like the Land and Water Conservation Fund a mere three percent of the time, while the other 97 percent of the time he’s voted with those that would dismantle, degrade and dispose of our public lands, said Brune.